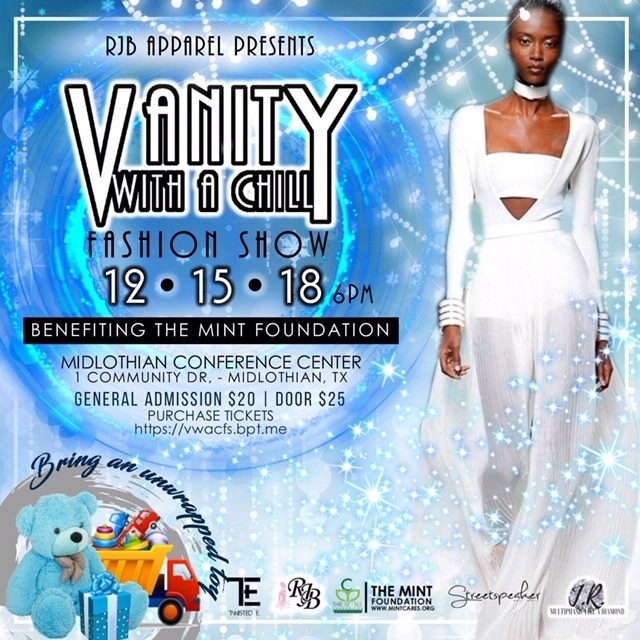 Empowered by both a flair for fashion and a desire to help those in need, Rashida Brown will partner with the Mint Foundation to bring a winter-themed fashion show to Midlothian that will benefit children and families in need. The fashion show, held on December 15th at 6 pm will be inside the Midlothian Conference Center located at 1 Community Drive in Midlothian, Texas. Attendees will contribute to the Mint Foundation by paying $20 for tickets and bringing an unwrapped toy that will be delivered to the children that the Mint Foundation serves. The mission of The Mint Foundation is to empower children and families to be self-sustaining through education, training, mentoring and service. Purchase tickets at vwacfs.bpt.me or visit mintcares.org to learn more about the foundation. Learn more about RJB Apparel Brand at www.shoprjbapparel.com and on Facebook and Instagram @RJBAPPAREL.